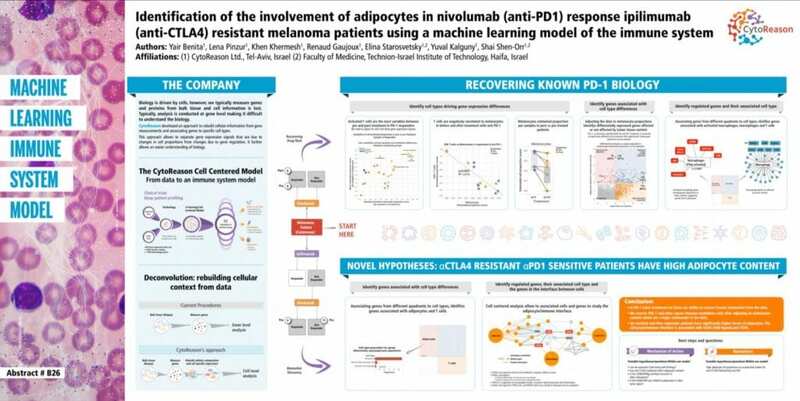 Analysis of data from melanoma biopsies, using CytoReason's proprietary machine learning-based approach, identified cells and genes that distinguish between nivolumab responders and non-responders in a cohort of ipilimumab resistant patients. The analysis revealed that adipocyte abundance is significantly higher in ipilimumab resistant nivolumab responders compared to non-responders (p-value = 2×10-7). It also revealed several undisclosed potential new targets that may be valuable in the quest for improved therapy in the future. "The immune system is predominantly cell-based. CytoReason is unique in that our disease models are specifically designed on a cellular level – replicating biology to crack key biological challenges, while learning from every data set", said David Harel, CEO, CytoReason. "CytoReason's computational platform integrates genetics, genomics, proteomics, cytometry and literature with machine learning to create our disease models. This analysis further demonstrates CytoReason's ability to generate novel hypotheses for new biological relationships that are often hidden to conventional methods – providing vital clues that are highly valuable in the drug discovery and development process." CytoReason is one of the largest systems immunology groups in the world. At the core of its capabilities is a unique and singular focus on re-defining understanding of the immune system at a cellular level. The immune system is implicated in a vast array of diseases (and treatments), that go far beyond those diseases clearly defined as immune-related. CytoReason has spent more than a decade building up its Cell-Centered Model, through development of the most accurate machine-learning technologies trained on the most extensive and inaccessible data. CytoReason is not a typical AI company. It applies fundamental biology practices to solve the fundamental biological issues that form some of the biggest challenges facing the biomedical research community today. Using the Cell-Centered Model as a blueprint, CytoReason is able to uncover unseen insights into the correlation and causality of the gene/cell/cytokine relationships that lie at the heart of understanding diseases, and the treatment of those diseases – and do so faster and more accurately than was ever possible before.